Kramer Real Estate & Contents Auction — Harritt Group, Inc.
50 Acres, 2 story home, 2 barns surrounded by woods, pastures, pond, your own shooting range and air strip for remote control planes located in Orange County just 5 miles South off US 150, 13 miles East of Paoli and 40 miles West of Louisville. Also selling 95th Anniversary Harley Davidson, Polaris ranger, firearms, remote control planes, tools, zero turn mower, household items and more. Pristine 50 acres in Orange County with frontage on two roads includes spacious two-story 4-bedroom 3-bath 2300 square foot home with walkout basement, attached 2-car garage, above ground pool and decking, pond plus 2 pole barns with workshop and lean-to. 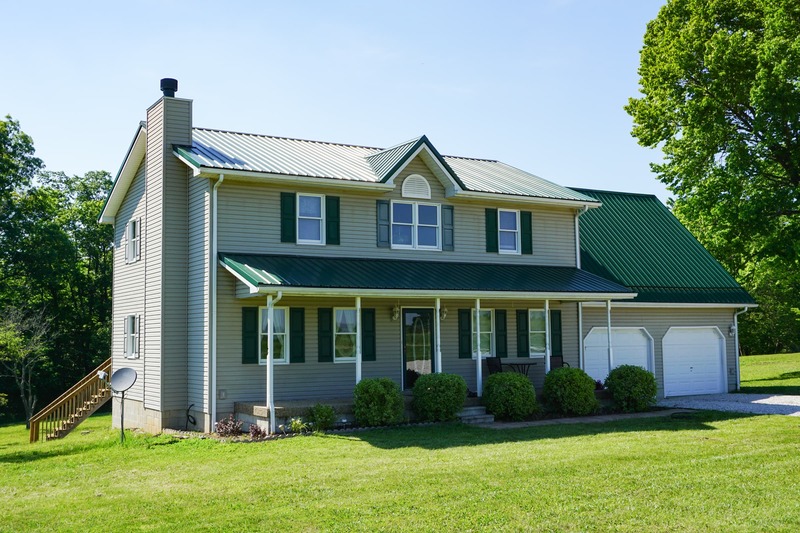 Fresh to the market this country style vinyl sided home with metal roof built in 2000 features spacious eat-in kitchen with breakfast bar, dining room with french doors, family room with fireplace, office and full bath on first floor. A large master bedroom suite up with jetted tub, 2 walk-in closets, 3 additional bedrooms (one being the bonus room over garage) and full bath plus full walkout unfinished basement, covered front porch, rear deck and above ground pool with decking. Plenty of space for outdoor activities includes custom 30’x40’ garage built in 2008 with 2’x6’ construction, insulated metal walls & ceiling, workshop and one bay with 10’ door, a 24’x24’ galvanized pole barn with 11’x24’ lean to, a pond, shooting range and your own air strip for remote control planes. Beautiful tract of land consists of approximately 32 acres wooded and 18 acres of open pastures with 1200’ feet of road frontage on 575 East plus additional frontage on 425 East. 10% Non-refundable down payment day of auction, balance due in 40 days. Buyer to assume Spring 2017 installment due Spring 2018 and all subsequent taxes. Possession immediate upon closing. One-owner 1998 Harley Davidson Ultra Classic 95th Anniversary Edition with 25,259 miles, Vance Hines pipes, Corbin leather seat, extra chrome and more. 2013 Polaris Ranger XP 900 EFI, 4X4, chrome wheels, orange & white, dump bed, cab, doors & hydraulic snow blade with quick hitch, 2419 miles, 163 hours. Kubota ZD28 diesel zero turn mower 72” cut 343 hours, Swisher 34 ton 9hp hydraulic wood splitter, Honda GX200 2700 PSI pressure washer, Dewalt table saw with 60” table & 53’ Biesemeyer fence, drill press, 110V compressor, Jet JSG96 belt sander, snap on rolling tool chest, Troy Bilt Bronco 6hp rear tine tiller, Poulan 4.5hp 21” push mower, lawn trailer, Little Giant folding ladder, Werner 16’ extension ladder, motorcycle jack, (2) Stihl chainsaws, floor jack, creeper, Ranger tool chest, Dewalt power tools, hand, yard & power tools, metal shelves, electric chain hoist & more. 10’X5’ single axle utility trailer w/drop tail gate. Savage model 10 MLZ stainless 50 caliber bolt action black powder rifle with laminated stock Serial# M027181, Ruger model 10-22 carbine rifle w/mannlicher stock & Picatinny scope rack, Springfield Armory M1 Garand US rifle with bayonet Serial #1513928, Fabrique Nationale 30.06 bolt action rifle Serial#1121, Interarms Mark V 7mm X 57mm rifle customized w/3 position Winchester safety Serial# B 299408 plus assorted ammo and reloading equipment, Martin Phantom Compound Bow camouflage completely set up & tuned with mechanical release w/case, Rancho Safari backpack quiver, military knife, gun case for ATV, WW11 helmet & backpack. 9 assorted model airplanes, several controllers, parts & flight box. 2-piece pine cupboard, king size California pine poster bed, chests, nightstands, floral print sofa, tan Lazy Boy loveseat recliner & recliner, glider rocker w/gliding foot stool, large rocker, Queen Anne wing chair, blue arm chair & ottoman, oak TV cabinet, metal shelves, assorted tables & chairs and more. BIG Green Egg ceramic charcoal cooker on cedar stand, iron patio furniture, 10’X10’ screen house, pool lounge chairs, pool & camping items, Men’s Supergo Access mountain bike and Arriba mountain bike. Ladies 18K white gold diamond wedding set, ladies 10K gold ring with opal, jade bracelet & necklace, jewelry box, Denon AL24 receiver, Panasonic 50” plasma TV, vintage Bose 901 speakers on stand, surround sound speaker, Blue Ray disc player, AVR 3806 equalizer, stainless rolling kitchen cart, bread maker, telescope tripod, #3 crock, brass Ideal Brennan 20” hanging kerosene lamp, crochet ring, prints, stainless steel food dehydrator & sausage grinder, dehumidifier, vintage Pabst bottles, plastic storage box, kitchenwares and more. I-64 to Hwy. 150 Greenville Exit #119. West 28 miles to left on Oak Grove Road – 575 East. South 5 miles to auction on right. Or just North of St. Rd. 64 in Marengo, 13 miles East of Paoli or 40 Miles West of Louisville off Hwy. 150.